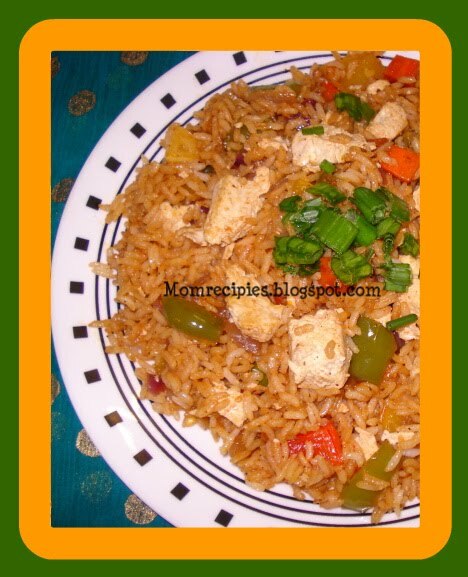 Tofu is rich in protein.Since tofu is made with soybeans,it is also low in cholesterol.Pilaf is known as pilav, pilau, plov or pulao in different countries of the world,and there are hence various delicious pilaf recipes.This tofu pilaf recipe is a very simple one and also quite nutritious. I didn’t have basmati rice at that time, so I just used plain rice. If you cook it with basmati rice, the flavor and taste will be much better . 1) Wash the rice, drain the water and leave it on the sievefor sometime. 2) Drain and Cut the tofu in small cubes and marinate them in soya sauce for around 30 minutes -1 hour. Firm Tofu will absorb any spice and sauce added to it. 3) Heat 1 tbsp oil in a non stick pan and lightly brown tofu pieces on both the sides and keep aside . 4) In a pressure cooker, heat oil and add cumin seeds.Then add the cinnamon ,cardamom and bayleaves. 5) Then add the ginger garlic paste , green chilli paste and dried basil leaves. Add the onions and saute for sometime. Add vegetables and saute for 7 minutes then add the rice and stir well. Then add the deep fried tofu.Add salt to taste. Add around 2 cups of water and pressure cook for 2 whistles. 6) Stove Top: Bring to a boil, cover & simmer 10 - 15 mins till rice is done. 7) Garnish with chopped spring onions and fried cashews if using . 8) Serve hot with raitha . Tip:- You can use the veggies which ever you want.